VirusTotal, a popular web-based virus scanning tool, announced its very own acquisition by Google. While details regarding the deal remain mostly secretive, VirusTotal says it will continue to operate independently of Google and maintain its multi-faceted sphere of partnerships with various security vendors and experts. Since 2004, the on-demand, web-based scanner has allowed users to scan uploaded files or websites for malware, analyzing their security risk by utilizing a multitude of popular anti-virus engines and other resources. The service has remained in operation for nearly 8 years. Virus total says the deal will help it improve the quality and reach of its service. The exact purpose of Google's acquisition remains unclear, but there are some seemingly ostensible benefits to having VirusTotal under its belt. 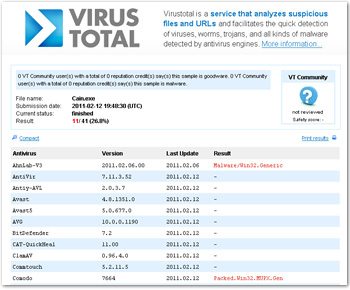 For one, VirusTotal could help Google fortify its already existing, cloud-based, anti-malware solutions. After all, the search giant already provides its own limited virus protection to users, most notably through Gmail and its search results. In the past, the company has utilized its search engine to detect certain threats on visitor computers. Meanwhile, the company's Safe Browsing API -- a technology leveraged by the likes of Chrome, Safari, Firefox and others -- is used daily to protect users from nefarious websites and potentially malicious downloads. VirusTotal's technology and partnerships may help supplement this endeavor as well. Lastly, it's also entirely plausible that Google may simply be looking to buy its way into more partnerships. After all, VirusTotal has spent the past 8 years schmoozing with anti-virus developers, security firms and security experts to offer what it does to the public. As such, Google may have seen VirusTotal as an easily opened door to the industry.